Did you ever wonder why they put Mike Milbury on TV to talk about hockey? After all, during his playing days his greatest achievement was being a member of the Boston Bruins gang that went into the stands to beat up some New York Rangers Fans. Then, as general manager of the Islanders, Milbury made one terrible decision after another. I mean, the players either traded away or passed up by Milbury in the draft include Zdeno Chara, Roberto Luongo, Todd Bertuzzi, Dany Heatly, Marion Gaborik, and Jason Spezza—though in fairness, he couldn’t have had both Heatly and Gaborik, since they were in the same draft…the one where Milbury selected the perpetually injured Rick DiPietro first overall. So what about Milbury as a commentator? Well, he hasn’t really done anything all that outrageous. He just says a lot of ridiculous things. For example, last night while talking about the wacky Penguins-Flyers game—each team scored a goal in the last two minutes in Philly’s 6-5 win—Milbury compared Sidney Crosby and Evgeni Malkin to crack addicts. Was he trying to say that Sidney stole money out of his aunt’s purse at Christmas, or that Evgeni broke into his friend’s aunt’s house and stole her television? No. All he meant was that Sid and Evgeni were too offensive-minded and didn’t get back on defense enough—that they were “addicted” to scoring. 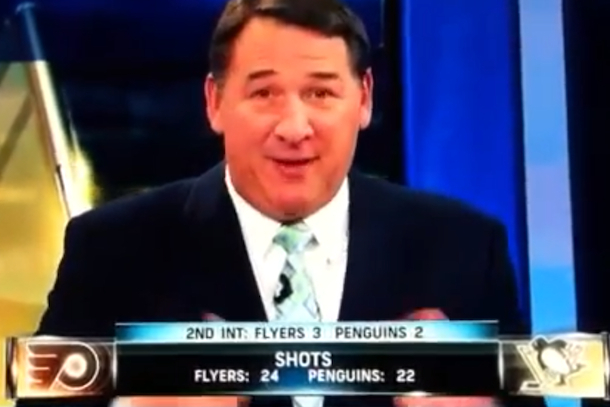 This wasn’t the first time Milbury has ripped into Sidney Crosby, but it was the most creative. Way to go, Mike. Keep up the good work.